While you walk the lonely street on this valentine, you'll see many couples getting lovey-dovey all over the place. Facebook, twitter, restaurants, particularly movie theaters will be overwhelmed with love birds celebrating this “special day” while the singles are left feeling extra-lonely. However, much the same as there are a sure things that no one but couples can appreciate, there are couple of things no one but singles can. 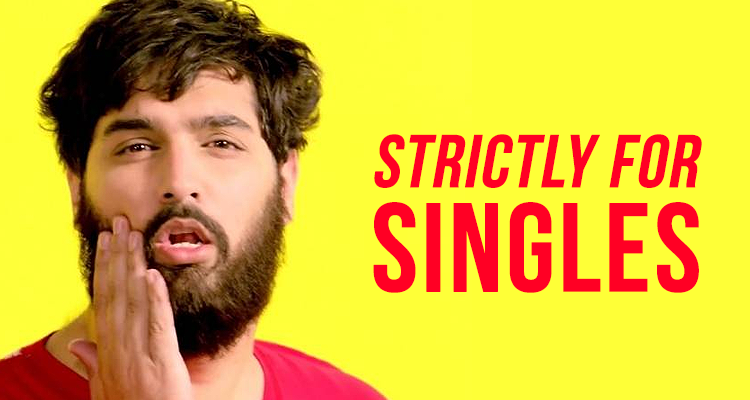 Enjoy this kickass playlist we made for all singles. Well, if you can enjoy life like that and say Khud hi se maine ishq kiya re. then do you even need anything else in life. The next time your annoying couple friends try to hook you up with somebody, you know what to say, I know you want me but you’re never gonna get me, tere haath kabhi na aani. Just tell your dil to STFU and go to hell. You’ll feel a lot better. TBH, it’s one of the happiest and most practical break up songs there are. Ghatni hi thi yeh bhi ghatna, ghatte ghatte lo yeh ghat gayi. Use phone mila, aur gaali de, photo jalaa ke kar de raakh, saale tere maa ki aankh. We’re sure your friend who didn’t like your ex will enjoy this one more than you will. This one’s your anthem. Blame them for all the emotional attyachaar they put you through and dance it out. The passive aggressive folks who have more than had it with their ex, say Jaa Chudail and get your groove on. Feel lucky for not being Kutta in relationship.